Chipmaker Micron Technology (MU) has been bleeding during Thursday’s morning trading session and has nosedived about 10%. This has happened to a company which announced a week back about its $3 billion investment and a creation of 1,100 jobs in a decade’s time. All the semiconductor stocks have been trading in the negative territory today. Morgan Stanley’s reporting on semiconductor stocks created an adverse reaction and dragged them down. The PHLX Semiconductor Index (SOX), which is composed of the 30 semiconductor companies, dropped more than 2%. Morgan Stanley stated that the weakening demand for the DRAM products have created an excess inventory and this will hurt the companies in the fourth quarter. Adding to the worries of the fourth largest US chipmaker, analysts of Baird, who predicted a 10% sequential dip in third quarter for memory chip prices, and retained their Outperform rating of the Boise, Idaho-based firm early this week, removed Micron from the top ideas and lowered its price target from $100 to $75. Last week, Micron announced its proposed expansion representing $3 billion of capital and investment and creation of 1,100 jobs by 2030. The company plans to increase its memory production at Manassas, Virginia plant. As part of this investment, Micron will also set up an R&D center in Manassas for developing memory and storage solutions. Another semiconductor company that got hit heavily on Thursday was KLA-Tencor (KLAC). The stock was down about 10% after the management provided a downbeat outlook at the Citi Global Technology Conference today. Towards the end of the day, most of the major semiconductor stocks were battered and trading in the negative territory. This list includes Applied Materials (AMAT -5%), Lam Research (LRCX -7%) and ASML Holding NV (ASML -6%). 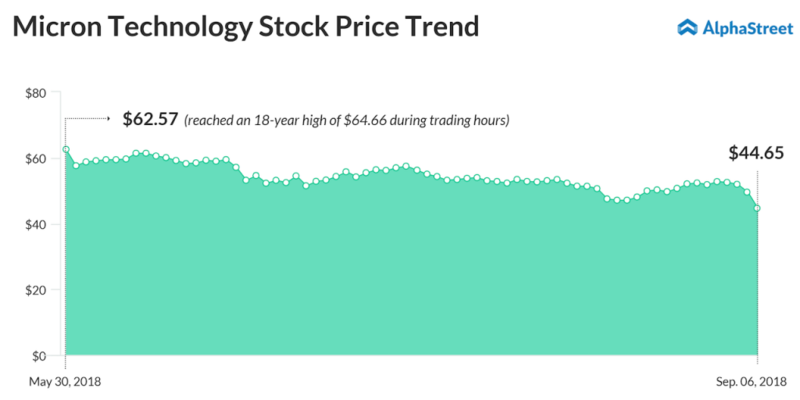 Shares of Micron Technology, which rose about 10% in the year-to-date period and surged 40% in the past one year, have plunged 30% from its 18-year high ($64.66) achieved during the end of May. 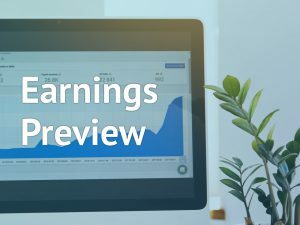 On this background, the company is set to report its fourth quarter 2018 results on September 20.